It’s Wednesday! What does that mean? That means there is a huge slate in the NBA and we have plenty of action to bet on. Now that the NFL is over it’s time to bet the NBA more. Head over to BetOnline to bet on the NBA including straight bets, props and everything in between. New players will be eligible to earn a 25% bonus for up to $1000 when they join. I went back and forth on this one for a bit, but I’m sticking with my gut and betting on the Nets (19-28) to cover against the Raptors (33-16). The point spread is simply too big. Toronto will want to win big I’m sure, as they hate the Nets after last year’s playoffs, but I don’t think they’ll cover. The Raptors are playing great, but a lot of their wins are close. The Raptors score 106.1 PPG (5th), but they give up 101.0 PPG (21st), which is too many. The defense has been a big problem and rebounding (41.9 RPG – 21st) has been poor as well. Brooklyn is below average in just about every statistical category. 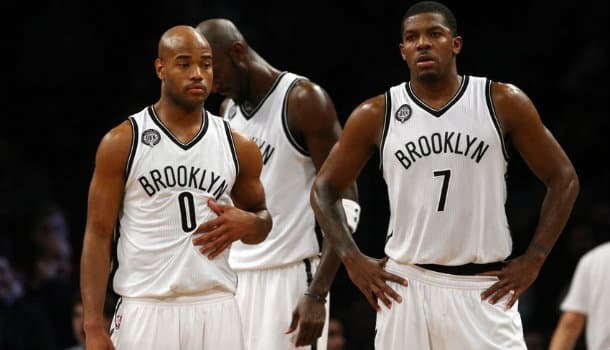 The Nets score 95.8 PPG (24th) while giving up 99.6 PPG (16th). They also rank 22nd in rebounding and assists. DeRozan has been spotty since coming back and he takes a ton of shots, so if he isn’t on the Raps struggle a bit. I like Jack to have a big game for the Nets and they’ll keep this close. This spread seems a bit fishy, but I’m jumping on it while I can. The Heat (21-27) are 8th in the East and fighting for their playoff life whereas Minnesota (8-40) is last in the West. Minnesota has absolutely nothing to play for at this point and they’ve shown that, as they’re 2-8 in their last 10 games. Miami just lost to Detroit last night, so this is a B2B situation. Even with this being a B2B I have to bet the Heat. They can’t afford losing to teams like the Timberwolves if they want to make the playoffs in the East even if they’re not rested. Dwayne Wade is out for the Heat, but that shouldn’t matter. Whiteside has been a beast for Miami since he has been in the starting line-up plus Chalmers has stepped up. Miami should pound the basketball down low to Bosh and Whiteside in this one. They’ll have an edge in the paint and should win. An experienced team like the Heat will beat Minny. I’m going with the Nets, Heat and Hawks on a 3-teamer that pays out at 6/1 odds. The Hawks (40-9) are 1st in the East and they’re 9-1 in their last 10 games, which is insane. They play the Wizards (31-18) who are 3rd in the East. This game will have a bit of a playoff atmosphere. Washington is 13-10 on the road and their home/away splits are pretty bad. Horford is playing great right now. Horford and Millsap should control the paint and put in a lot of easy buckets. I also like the grittiness of the Hawks, especially when playing at home. Atlanta lost in their last game and they’ll want to bounce back quickly. This team is deep and they’ve only lost 3 games at home. They have to cover –5.5 points, but that should be fine.